Finally, I started working on June 21, 1982, a day I will never forget. The previous night itself, with the help of the local rickshaw drivers, I had rolled the mobile cart to the beach. It was a small move but thrilling as it was my own and I was going to be a business woman the next day. While such carts sold only tea and cigarettes, I decided to sell cutlets, samosas, bajjis, fresh juice and coffee and tea. On the first day, I sold only one cup of coffee and that was for fifty paise! I was very disappointed and came home crying. I told my mother, that I would not like to continue. But my mother consoled me saying, at least you sold one cup of coffee. That’s a good sign. You will do well tomorrow. And, she was adamant that I go the next day also. The next day, I made sold snacks for Rs 600-700 which was big money for me then! As I started making money, I added ice creams, sandwiches, French fries and juices too. I used to keep thinking of adding more items. I ran it from 1982 to 2003, and the maximum I made from that mobile cart was Rs 25,000 a day. That was during the bandh days! We used to be open from 3 p.m. to 11 p.m. every day, and later, I started opening from 5 a.m. to 9 a.m. for the walkers. I used to personally stand there and sell all the stuff I made. I never felt scared to stand there late at night. My only thought was to prove myself and move ahead. There was a fire in me that made me believe that I could be successful without anyone’s help. I did not want to be a failure. If you have that fire, nothing in the world can stop you from succeeding. On seeing my work at the beach, within a year, the Slum Clearance Board gave me an offer to run the canteen at their office with a proper kitchen. The chairman met me during her morning walk. That is how I got the offer. The canteen was a huge success. On Wednesdays, it was the public grievance day, so about 3000 people used to come there and I had a roaring business. One day, after a fight with my husband who used to come to trouble me often, I boarded a bus and travelled till the last stop. I got down and saw the National Port Management training school run by the Central government. On the spur of the moment, I told the security guard that I wanted to meet the administrative officer. I met him and told him that I was a caterer and that I heard they were looking for a one. He said, to my surprise that they were indeed looking for one as they had problems with the current contractor. I still believe it was God who took me there. My first weekly payment was Rs 80,000. I felt so elated having seen only hundreds and thousands till then. During those times, I was earning almost a lakh a week. In those days, I wanted to do everything personally as I felt only then, things would run smoothly. Now I know if I train people well, they will do the work the way you want. My connection with restaurants started in 1998 when I met people from the Sangeetha Restaurant group. They offered me a partnership in one of the units. 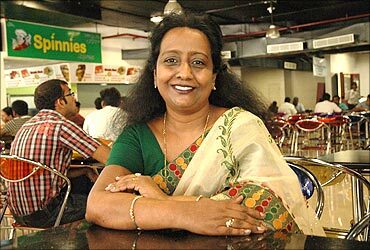 But my son, Praveen Rajkumar wanted me to start my own restaurant and build a brand of ours. But destiny played truant with me again. I lost my daughter, Pratibha Sandra and son-in-law road accident, a month after their marriage in 2004. It shattered me, and I withdrew from all that I was doing. Then my son took over and started the first restaurant ‘Sandeepha’ in my daughter’s memory. It took some time for me to come out of the shock and start helping my son in the business. Now, I am fully involved in the business. The fire to succeed has come back to me now. I still cannot get over my daughter’s death as I did all this for my children; to bring them up and give them a good life. What shocked me was the way the accident victims were treated by the ambulance operators. When they found that all the four in the car were dead, they said they would not carry dead bodies. Finally, somebody carried all the dead bodies in the boot of a car. When I saw the bodies being taken out of the boot, I broke down. No mother can bear such a scene. That is when I decided to keep an ambulance on that very spot to help people whether the victims are alive or dead. It is in memory of my daughter. Till now, I had no time to think of what I was doing. But the award made me look back and relive the days that passed by. Now, my ambition is to build my Sandeepha brand.